There are few things which will bring a film to life than a good tracking shot, once the preserve of professional film makers, you are now able to purchase consumer grade camera sliders which you can use in your home movies. 1 What is a Camera Slider? What is a Camera Slider? To put it simply, a camera slider is a bracketed track that can be placed onto tripod legs or just a light stand itself. And while it may be small in size, it is a must have, handy tool that can completely change the way you take pictures. Think of it now: no longer do you have to worry about blurry photos when you’re trying to take action shots. A camera slider is necessary for things like tracking shots to make the photo look like it is in motion, or for reveal shots when you need to show more or less around the main object in your photo. Sound like a dream come true, doesn’t it? It’s true that camera sliders can completely change the way you take photos, taking your videos to professional quality. But if you are going to spend money on a camera slider you need to make sure you are buying the one that is right for you. That’s why we have put together this complete guide to camera sliders – we have spent weeks testing and filming with all the models featured. We have hand-picked the top 10 models which we feel give a representation of the market. Each model is reviewed honestly and we have listed the pros and cons for each one. Don’t have a whole lot of time to take a look at the reviews? Don’t worry. We’ve broken it down to the top 4 picks when it comes to camera sliders, guaranteed to bring your photographs and movies to an all new level. 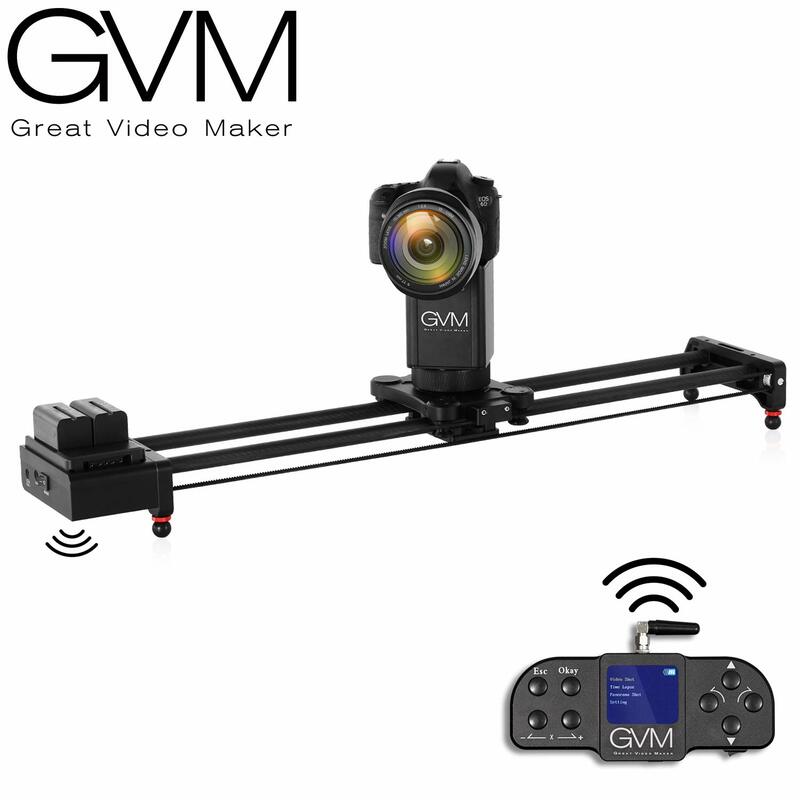 Best Overall – GVM Motorized Camera Slider. This is the go-to camera slider for everyone who is in the photography and movie biz. 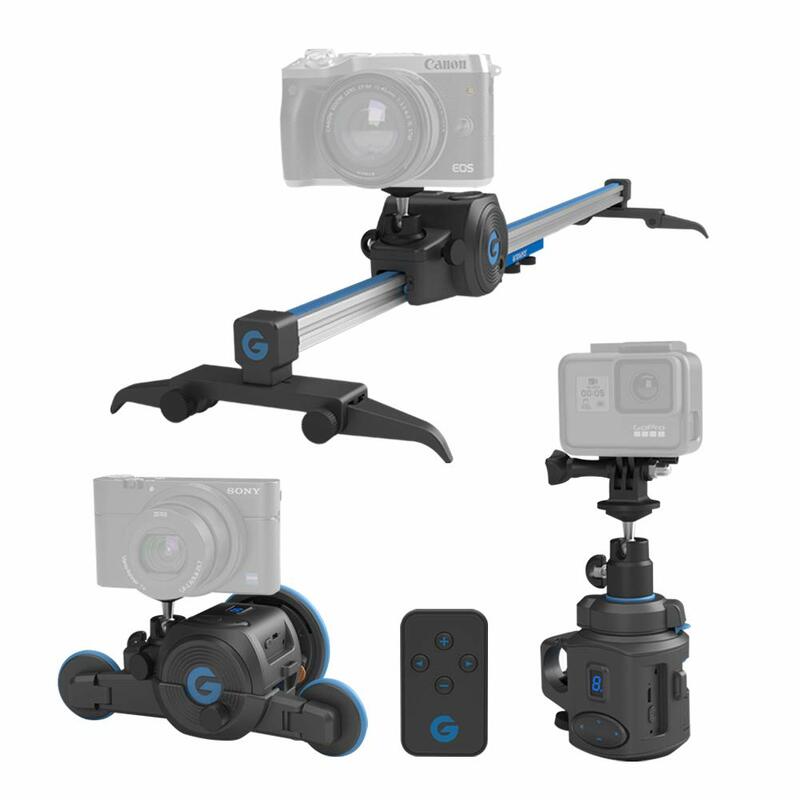 With premium materials and the ability to do tracking and panoramic shooting as well as video capture and time lapse, it’s the more stable and durable camera slider that can do it all. Best Budget – Electronic Camera Slider & 360° Panoramic time Lapse Head for Camera Motion Control. On a cheaper budget but don’t want to sacrifice on quality? Then you can’t go wrong with this Electronic Camera Slider. It can do it all- vertical, horizontal, even upside images and can be used for panoramic images, video capture, and time lapse as well. It’s a do it all machine that doesn’t cost an arm and a leg. 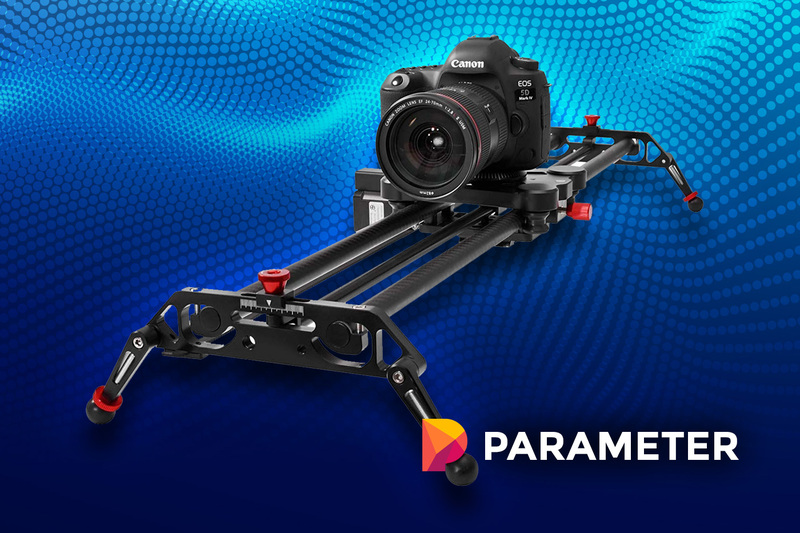 Best Premium – 2-Axis Motorize Camera Slider If premium upgrades are an essential to you, you will love the 2-Axis Motorize Camera Slider. It’s upgrades feature a 360 angle that doesn’t need to be manually focused. Bluetooth enabled means you can work easily and the quietest motor on the market keeps your entire set focused and happy. 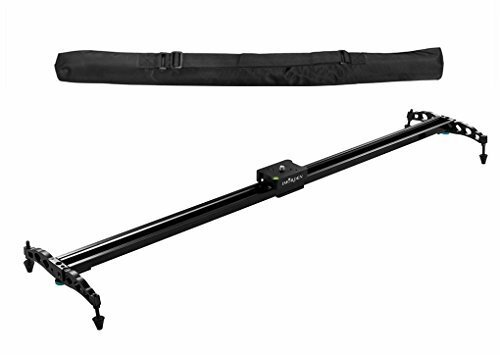 Best Value –Zecti 15.7” Portable Carbon Fiber Camera Slider. This is an excellent option for those who want something portable and lightweight. If you’re in search of a motorized camera slider that will change your photography life forever, then you need to check out the high-end, notable GVM Motorized Camera Slider. 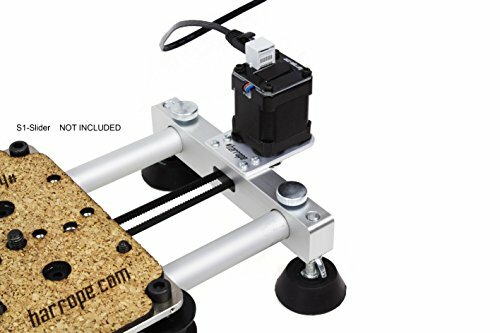 This sensational electric slider has the ability to help you with all of your camera needs, such as tracking shooting and panoramic shooting, while giving you the ability to use time lapse as well. The slider also can work with video capture and has a free set starting and ending point to make your job easier. And as far as the starting and ending points are concerned, you can set them quickly and easily with these options: a sliding speed that can be from 1 percent to 100 percent, slip intervals and stop times from 0.1 to 999.9, and the number of pictures you need from 1 to 999. You can rest assured that all of your shooting will be smooth and efficient thanks to the premium material support found on this product. All machines are made with aluminum alloy structure which ensures they are completely durable, while the updated motors keep your work running as smooth as possible. Need multiple angles for your job? You’re in luck! This unique and notable camera slider has the ability to shoot multiple angels thanks to the screw holes found in the slider. This allows for the slider to create angles vertically, horizontally, and 45 degree angles. Vertical, horizontal, and 45 degree angles. Load capacity up to 44 pounds. Set starting and ending points as needed. Can do tracking shooting, panoramic, time lapse, video, and free set. Need something a bit more portable for a smaller project? Just like the idea of having something lightweight that you can take with you wherever it is needed? Then you may want to consider purchasing the Zecti 15.7” Portable Carbon Fiber Camera Slider. This is an excellent option for those who want something portable and lightweight; and not only that, but this handy piece of equipment comes with a scratch-resistant carrying bag so you can take it wherever it needs to go. Even wrapped up in a piece of luggage and throw on an airplane, this camera slider is just fine and ready to used when you get to your destination! When it comes to efficiency, this lightweight portable camera slider is the way to go. It is strategically built with four bearings and a double carbon fiber rail system on the interior so you can rest assured that the camera is stable and secure while offering movement this is both precise and quiet. It is easily connected to photographic equipment, so you can spend less time fiddling with hookups and more time creating a masterpiece. Versatility is the name of the game when it comes to this camera slider. Thanks to the addition of screw holes on both ends, you are able to mount this camera slider in a variety of positions for better angles and shots. You can easily place this camera slider on the ground for straight shorts, or position it on a slant to get different horizontal and vertical angles. Need a camera slider with feet? You will find that option with this camera slider! The non-skid rubber feet ensure this camera slider can be used on any surface that it is needed and fine adjustments can be made with ease. Looking for an upgraded model that can guarantee to get the job done? Then you may be in luck with the Neewer 31.5 Inches/80 Centimeters Carbon Fiber Camera Track Slider. You’re probably curious why we tossed in the word ‘upgraded’. Well, that’s a good thing to wonder and we’re going to let you in on why this model is completely upgraded: thanks to the all new u-shaped ball bearing found on the underside of the sliding part, you can rest assured that the motion is overly smooth with no friction or abrasion between the carbon fiber tubes. This is necessary to ensure that your equipment stays in top notch shape and the motion is smoother than smooth and perfect while videoing or photography. Another positive things about this particular camera slider is that it is entirely flexible. The track can be used by itself on the ground, or it can be connected to a tripod for a versatile range of angle options. Need something vertical? This camera slider has you covered. What about horizontal or 45 degree angles and everything in between? Again, this is the go to camera slider for all angles that you desire. The unique legs found on this camera slider also give it an edge in the competition. Something you can be confident in is the completely adjustable and secured legs that give it a height from 8.5 centimeters to 10 centimeters, while the locking knobs and rubber feet keep it in place wherever it’s needed. Last but not least, this handy tool comes with a carrying bag so you can transport your equipment without fear of it getting damaged. This is extremely imperative for the artist who is on the move often and needs to make sure his tool is kept safe from the elements. This is a different style of camera slider, but one that definitely needs to be noted. The only difference? This one fits directly on a tripod or monopod and can spin in 360 degrees, rather than have to be position and moved from side to side like most other camera sliders. 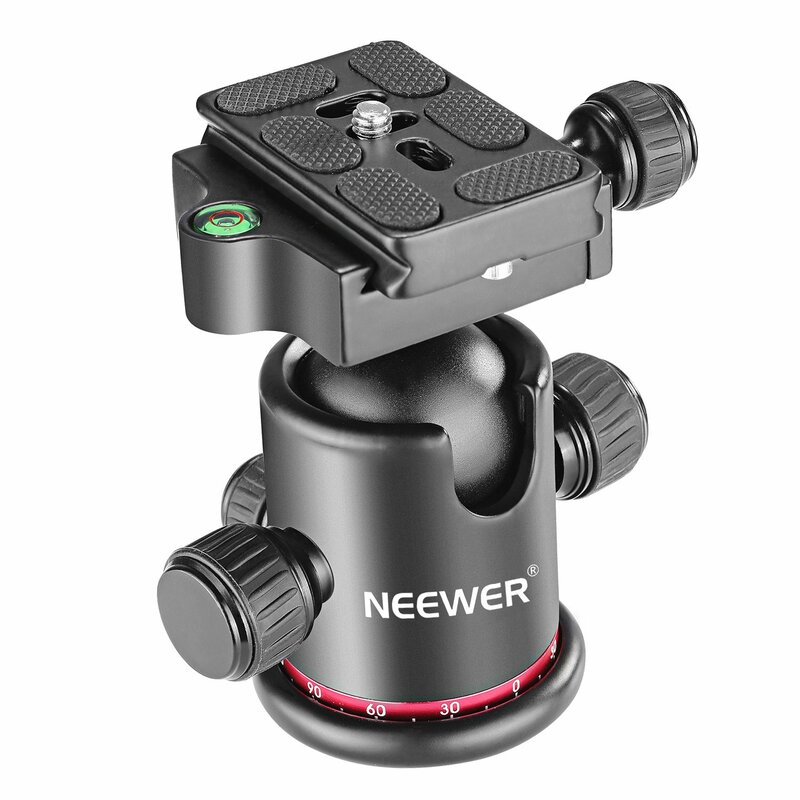 So why should you consider the Neewer Professional Metal 360 Degree Rotating Panoramic Ball Head? I think it says it all in the name, personally. The 360 degree swivel allows you to catch angles you never knew were possible, and certainly is not something you would find in a traditional camera slider. It comes complete with three different knobs that are completely adjustable, so making any angle come to life is a cinch. Secondly, the bottom screw thread that is attached to the device is easily connected with all of your favorite pieces of equipment. It could be the tripod you use every photo shoot, a monopod you have lying around, or even on a camera itself. Another great feature about this product? Its ease of use. You can put this device together in a matter of seconds- because who has time to waste when you’re trying to make a masterpiece come to life, right? With a horizontal and vertical bubble level, you immediately enhance all of your positions after slipping this camera slider onto your tripod or monopod. Always struggling with a device that suddenly plunges downwards when it is in a difficult angle? Put those days behind you with this camera slider. Unlike other camera sliders, this one is built with a Fine Tuning Damping device that will protect it from suddenly plunging during a shoot. That’s incredible! When it comes to a camera slider, you want to find something that has durability and stability without any messy problems. Sometimes you can get stuck in a rut with a camera slider that pulls and vibrates constantly, which means your slider is not working good and your shots could be completely ruined. Want to avoid all the hassles? Then you may want to check into the Harrope S1-Slider. The Harrope S1-Slider is an excellent choice for a variety of reasons. First ans foremost, you never have to worry about the camera slider causing unnecessary and annoying vibrating during your shoot. Thanks to the 6 bearings including in this slider, you won’t have to struggle with vibrations or loud noises. The 6 bearing also come in handy when it comes to pulling. Pulling can be detrimental when you’re doing a photo shoot or trying to record a video or movie, and choosing this product ensures you will never have an issue with pulling or tugging on any of your devices. A perfect shot every time, it seems! If you’re interested in doing video shooting then you may not be happy about this product not containing video services. However, this is a simple fix for this product. All you need to do is get the S1-Motor attachment for the camera slider. With that, you have the ability to take control over the video world and even make time lapses which are essential for a great movie. Need this camera slider to be longer in order to fit your needs? No worries! Another great thing about this camera slider is the ability to add attachments such as extension tubes. You can find 20 mm tubes that match with this product at any hardware store, which means this device is versatile and can handle any situation with ease. Worried about lugging around a large camera slider? Not looking forward to hurting your back every time you head out to a shoot? You will be happy to know that this camera slider is made completely of aluminum. This means that the device is extremely lightweight and a breeze to carry around from photo shoot to photo shoot. All in all, it’s a great value. The Harrope S1-Slider is a great model and when it comes to versatility you know you’re getting the best. You can add attachments as necessary, which is perfect for someone who has a variety of shoots they need to accomplish. 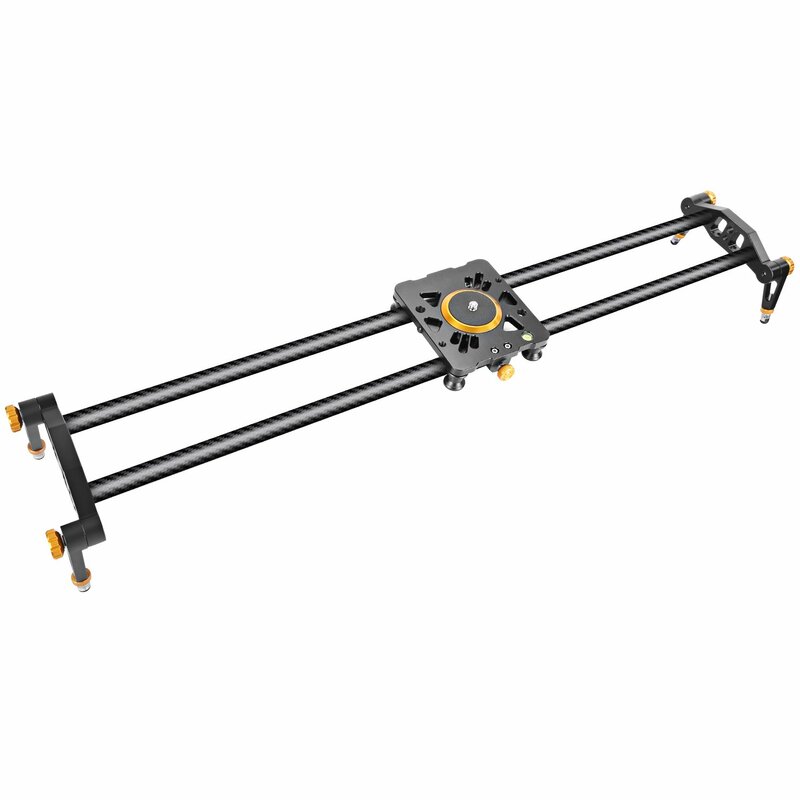 Another type of camera slider we HAVE to mention on this list is the camera slider dolly, more specifically the Pico Flex Dolly. Dollies have the ability to make your wildest camera dreams come true with a unique design that can capture more angles possible than any free standing camera slider could. 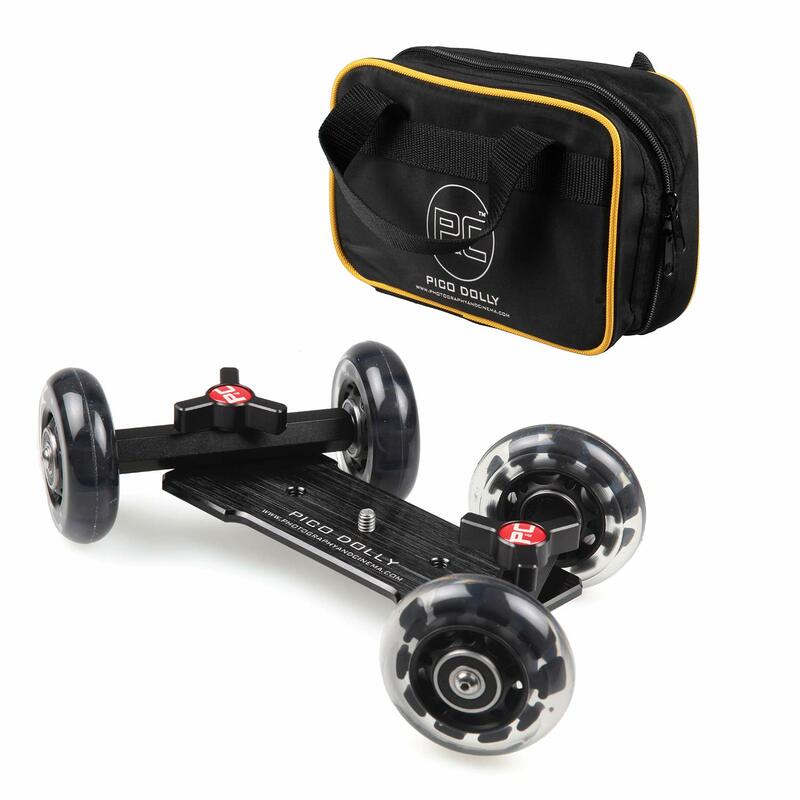 So what is to love about the Pico Flex Dolly? First and foremost, this camera slider is equipped with four wheels which means you can create more dynamic shots from angles you would not believe. You can whip this device around the room in an instant and capture all sorts of different angles and visuals that would be seemingly impossible without it. You can rest assured that this camera slider is going to stick around for the long run. That is because it is designed with a completely full metal construction. It’s built to last, so you don’t have to worry about replacing it anytime soon. The full metal construction also proves that you can use this device in a number of different scenes, even the more rougher ones where being sturdy is key for any equipment on the premises. The Pico Dolly is ready for anything. With a specially made machined plate, this sturdy device can handle full size ball heads on top as well as articulating friction arms. Not only that, but the heavy duty plate gives enough support to handle camcorders and full size HDSLRs. Need specialty accessories attached? Then this is the product for you. If you need LEDs, small monitors, or even microphones on your set, the Pico Flex Dolly can equip it. This allows for more creativity to shine through without worrying if your equipment is up for the challenge! Worried about the wheels on this dolly? Don’t be! They are specially made with a fluid bearing and a softer material than typical wheels found on skateboards, so the dolly glides over surfaces with ease- just make sure you’re using this on a hard surface, or otherwise it may become stuck. Last but not least- this dolly comes with a handy nylon zippered case so on-the-go shoots are a breeze. Just throw your dolly into its bag and be on your way! Running low on cash and also dealing with a small space? Then this device has you covered! This is a fully equipped remote control camera motion control unit. Not only can it be converted into a camera slider, but it can also be used as a Panorama mount as well. This type of versatility is important for many artists out there, so knowing that there’s options when it comes to this Electronic Camera Slider is a great benefit. Another great thing about the Electronic Camera Slider is that it comes with a whopping 9 options when it comes to speed and powered by a remote control. This means you can slide and move this camera slider all over the place to capture the photos and visuals you absolutely need. It can mount on a tripod too, in case you need something a little bit less active but more specific. So what can you do with this specific product? Well, one thing you will want to do with it is create awesome videos as well as time lapses using the camera motion! It is super easy to use and you’ll put together little videos that rock. Worried about lugging around a big piece of equipment? Put those worries to rest. This lightweight device is durable yet easy to carry around, while the quick setup leaves you feeling carefree and functional. You will be delighted to know that there is no apps required to use this piece of equipment, and it packs away quickly and easily for easy maneuvering and moving from location to location. So how does this Electronic Camera Slider function? Because it is completely electric, you have the option of using batteries to power this thing up, or using an external USB power bank. This means that even when you’ve ran out of batteries you can still get to work. Another notable thing that should be mentioned about this product is the angles and speeds it can achieve. For starters, you can easily pick up on vertical angles, and as this product can go completely upside down, you can have fun with those angles as well. As far as speeds are concerned, you can use super slow speeds for time lapses or super fast speeds for real time footage. It is a breeze to put together a video you will love using this Electronic Camera Slider. So get ready to let your creativity be the boss. This model could easily be referred to as the ‘grand daddy of all camera sliders’. It’s the latest innovation of camera sliders on the market to date, and that’s why all the professionals are flocking to get their hands on this amazing, up to date camera slider that will truly shake your game up. One of the most notable things about this particular camera slider is the fact that it has a precise rotation of pan and tilt motors built directly into the camera slider. This means that you can create stunning 360 degree panoramic shots that will really leave you breathless. After all, a camera slider doing a full 360 isn’t something we have seen before and it’s certainly something we all know we need when it comes to taking pictures and making movies. Perhaps the biggest bonus to using this camera slider is the fact that you no longer need to adjust the focus manually. Unlike traditional camera sliders that will leave you bothered with focus, this precise piece of equipment does the process completely on its own so you can create without worrying about losing focus in the process. You will truly be amazed at how well this camera slider can focus, even when there is plenty of movement on the set! Sick and tired of motors causing a scene with all of their noisy motors? The unique design of the 2-Axis Motorize Camera Slider ensures that there is virtually no noise while the camera slider is in motion. The smoothness of the design ensures that everyone on set is happy and not bothered by a noisy motor that can really disrupt the course of your shoot. Love Bluetooth but never thought you would see it on a camera slider? Think again! 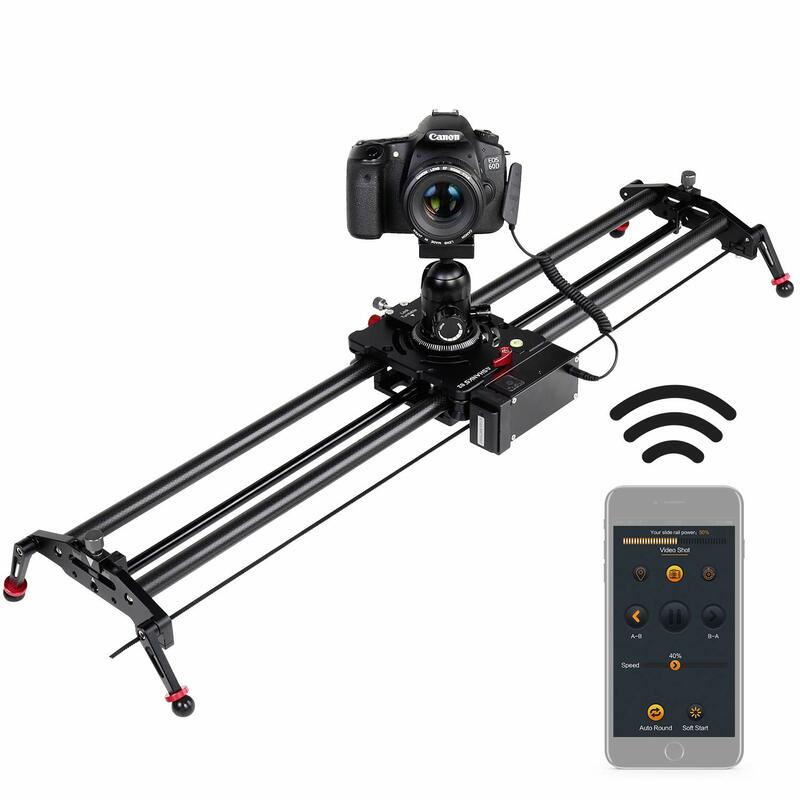 This astonishing camera slider brings up to date technology into the photography and movie making industry, giving you one of the first ever models to spot a wireless Bluetooth control. This means that you can use the wireless controller during your entire shoot, whether you need to adjust the cameras moving speed or direction, pause your film, and control the pan conveniently, making it rotate and tilt however you may need. If you are sick and tired of working with a camera slider that loses its battery consistently, you will find peace with the 2-Axis model. With this piece of equipment you can charge the battery without interrupting any of your slide tracks, and the battery can last up to a whopping 10 hours. That’s more than enough time to bring your dreams to life! What is more to love about this model? Last but certainly not least is its ability to be compatible with a wide variety of models out there, including most camcorders and well as micro cameras from Canon to Nikon, Sony to Panasonic. As long as it’s 20 pounds or less, this camera slider can handle it! If you are in need of something a bit more basic but still want a durable product that will get the job done, you will want to take a good look at the Imorden Camera Slider. One of the most prominent features of this camera slider is the fact that it can easily stick to any surface, which is ideal for those who have sets on a variety of different surfaces. It truly doesn’t matter what kind of surface is underneath this handy tool- it could be glass, marble, grass, or even rock. The Imorden Camera Slider will grip quickly onto any surface so you can worry less about mishaps and put more focus into your work. Another great thing about this model is the fact that it is equipped with two mounting holes which are easily connected to a tripod. With this usefulness, you are readily able to create horizontal and vertical images that are downright amazing. Made with heavy duty aluminum alloy, you can rest assured that this is a durable product that is built to last. It also comes complete with an anti-scratch and anti-abrasion material, so you can look high-end and professional even after years of use. If you need something that is durable and can handle any situations it is brought to, you can definitely make Imorden Camera Slider your next camera slider. It is budget friendly and ideal for the just starting artist that needs quality equipment that works with ease. Last but not least we have the ASHANKS Camera Motorized Slider. 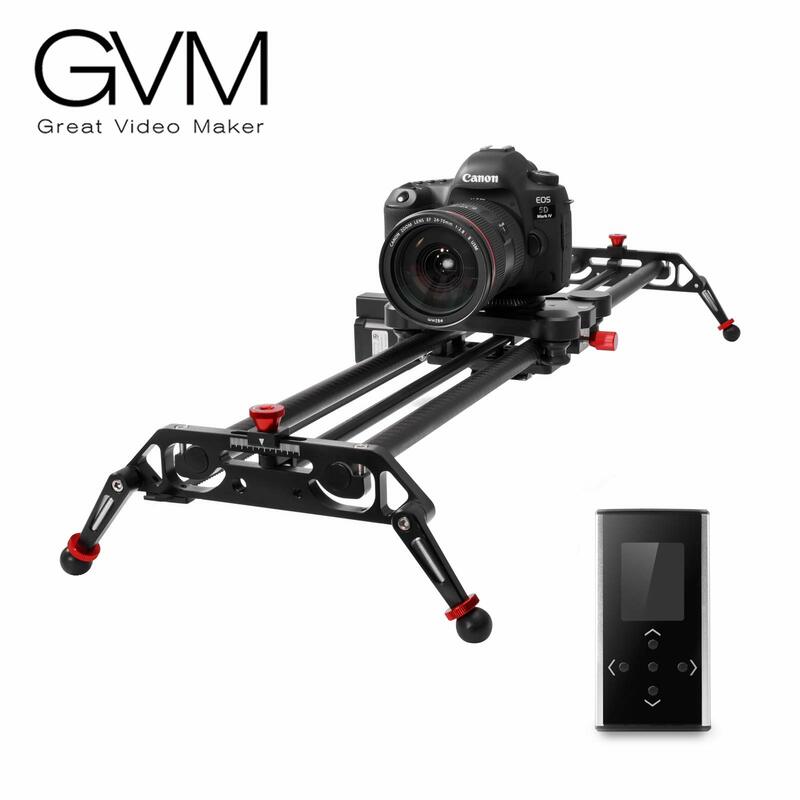 This is notably one of the most newest and sought after models because of all of the fancy and fantastic upgrades that are truly designed for the professional movie maker. There is truly no limit on what this model can do. If you’re in need of time lapsing and video capture, this model can do it with ease. 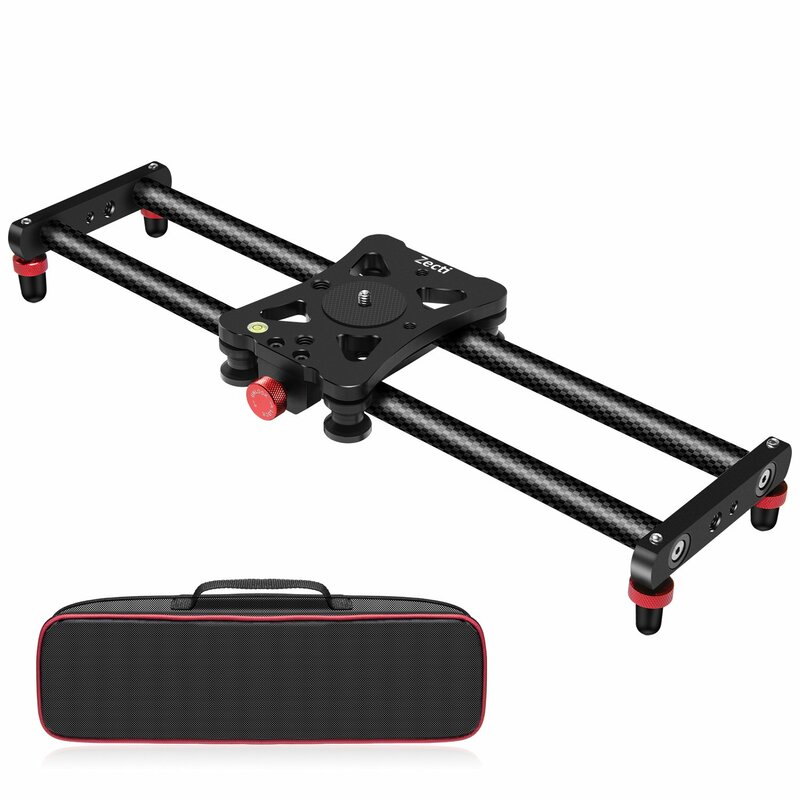 Some of the other amazing features you will find on this device is the 120 degree angle for panoramic shooting as well as automatic round trip, and a freely set start and end point which is ideal for movie makers out there. Want to do it manually? No problem! This model allows you to go back and forth between electric mode switching and manual switching, so you can still get the best of both worlds. For this camera slider, there are screw holes which allow for placement on a tripod with ease. It also allows ball heads so you can get more action from your camera slider, including all vertical and horizontal angles as well as 45 degree angles that capture the most incredibly images without a problem. The ASHANKS Camera Motorized Slider is a multifunctional slider that gives you the best of both worlds. With this unique device you can set up an automatic cycle so you don’t have to keep adjusting the product. Aside from that, you can enjoy a silent motor at all times thanks to the unique design, and even delay shooting- which is imperative when making a movie and something comes up. Sick and tired of struggling with a manual focus? You can put those days to rest with this device. The automatic focus system ensures you get the best shot that is completely blurry free, without you having to worry about a thing. Professional photos are a breeze with this device- and it seems as if it is completely hassle free! Want something that is bit more sturdy and durable? Then this model is right for you. Made with aluminum alloy and the addition of carbon fiber, this model gets a hefty dose of stability that will last a lifetime. With a sleek design and ease of use, this durable camera slider is the go-to for professional quality photos and videos that you will be overly satisfied with. Camera sliders are not a one size fits all type deal. Everyone has their own personal needs and desires, and before you start pricing out different camera sliders you need to make sure you’re taking all factors into consideration. The type of lens you need. There are several different types of lenses on the market. All of them have their own amount of versatility as well as positives and negatives, so ensuring you know the type of lens needed for your project is necessary. The material of the camera slider. You also need to take materials into consideration. Smaller projects will likely want to have a slider that is more lightweight, such as aluminum or carbon fiber. On the other hand, larger projects will need more capacity, so a heavier camera slider such as steel is needed. Length of the camera slider. Camera sliders come in a wide variety of lengths as well. The shorter of the sliders may be only one foot long while the heftier ones can get up to as long as five feet. As previously noted, a smaller scale project won’t need a camera slider that’s five feet long while a large project may require one that big. Do you need feet? Some small camera sliders on the market will already come with ‘feet’ built in. These feet can either only be steady on flat surfaces, or have the ability to grip onto any type of surface such as rocks. With built in feet you do not have to worry about carrying around a heavy, bulky tripod during your shoots which is a big bonus for photographers. Do you need special items attached? There are a variety of camera sliders that will actually allow you to attach specialty items onto your slider, things such as cranks and other unique devices. If you need any specialty items on your camera slider, that is certainly something to consider before making a purchase. Here are the answers to some common questions about camera sliders. How fast can a camera slider travel? Every camera slider is different. Newer models will have the ability to travel at a much faster speed than an older model, and it is important to check and see how fast your model will travel. If you’re not in need of a camera slider that can travel quickly, you may want to find an older or bulkier model that you need to move manually rather than something with a remote controller that can move at a pace of 35 miles per hour or even faster. Are all camera sliders motorized? The simple answer is no, not all camera sliders are motorized. Some camera sliders will need you to manually move your camera in the direction you need it to go. On the other hand, motorized camera sliders can be moved using a controller. Depending on your needs, you will want to double check to see whether or not the camera has to be moved manually and more technically or with a controller. Are all camera sliders silent? No, in fact a lot of camera sliders are not silent and may cause a lot of friction and noise. This is especially true if you are working with an older model or haven’t done your research on the right materials and ended up with something that is noisy and causes a lot of abrasion. When choosing the right camera slider for you, you will want to make sure the model is designed not to cause any noise or abrasion so you may work in peace. Can you make a camera slider longer? There are only certain models of camera sliders that will allow you to make the length longer by adding additional tubing. If you feel you may need something with plenty of length, it will be important to find out whether or not the model you choose allows for add-ons. Most of the time, a model that allows for the addition of length will also have other add-on features available as well, so this could be a big plus in the long run. How long do camera sliders last? The answer to this question will rely solely on the model you choose, the materials it is made out of, and how well the device is kept. A carrying case or bag is a great way t ensure that your camera slider is being taken care of while on-the-go. Make sure you clean your camera slider regularly and don’t be too rough with the model. While camera sliders are typically very durable and stable, accidents still can occur, so it is imperative you remain gentle and thorough with your device. Taking your photography and movie making skills to a professional level is a cinch with a camera slider. There are several options when it comes to lens, length, and other specialty features, so doing the proper research should be done by the individual before making a purchase. At any rate, the 10 best camera sliders on this list includes a little something for everyone, from basic models for the artist just starting out to advanced, over the top models that will satisfy any professional in the game.